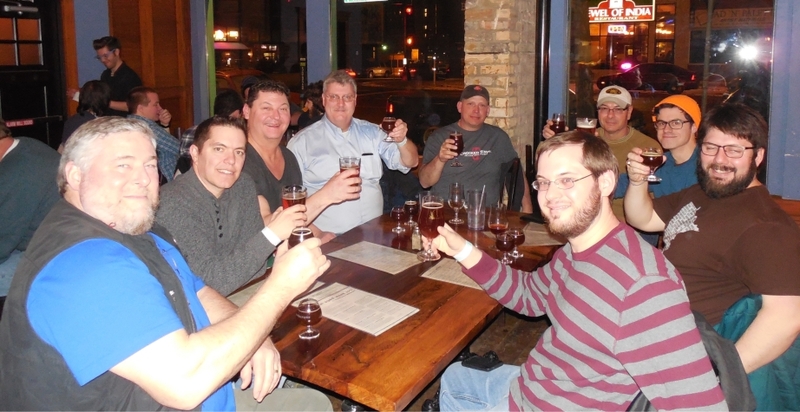 The Boreal Brewers were recently invited to join the crew at Fulton Brewing in Minneapolis to brew a couple batches of beer. We headed to the Cities on Friday afternoon, and made a stop at Northern Brewing to pick up ingredients, then off to our hotel to drop off bags. First stop… Surly’s new tap room for a beer and dinner. The food was great, the beer was great, and the company was better. It’s fun spending time with folks who share a passion about great beer. Next stop…Town Hall. It is “Barrel Aged Week”here at Town Hall, and we could not pass up the opportunity to sample some of Master Brewer Mike Hoops’ amazing creations. We had to wait a while for a table, but it is worth it. Everyone raved about the beer they tried. Wow! See tomorrow’s post for info about brew day. would like to try and do more beer things payed dues subscribed but have been unnotified of meetings,events and so on maybe didn,t have my email? I will ask Steve if he has you in the email list. I am sorry if you are not getting notices. Did you “subscribe” on the home page to get updates? In eleventh-century England, a bride would distribute ale to her wedding guests in exchange for donations to the newlyweds. This brew, known as Bride Ale, is the origin of the word 'bridal'.